UNISELECT™ Mammalian Cell-Based Membrane Proteins Antibody Discovery & Screening! Applied StemCell provides Custom TARGATT™ Master Cell Generation in your cell lines, and ready-to-use TARGATT™ HEK293, and TARGATT™CHO to build protein libraries using site-specific transgene integration at a preselected safe harbor locus. This is a fast, unique and efficient platform for biopanning, including bispecific mAbs, antibody discovery/ screening, membrane proteins, CAR-T cell screening, and for bioprocessing. Figure 1. Schematic representation of site-specific gene insertion using TARGATT™ Master Cell Lines. The TARGATT™ Master Cell Line is engineered with the attP landing pad (or docking site) at a preselected safe harbor locus (hROSA26). The TARGATT™ PhiC31 integrase catalyzes an irreversible reaction between the attP sites on genome and the attB sites on the donor vector, resulting in integration of a single copy of the GFP reporter gene at the locus. Figure 2. GFP expression in hROSA26 locus in TARGATT™ HEK293T Master Cell Lines. The CAG-GFP vector was used to verify a fast knock-in in the TARGATT™-HEK293T Master Cell Line. An enriched GFP signal was shown under fluorescence microscopy. (Left) bright field microscopy. (Right) Immunofluorescence; GFP channel. Figure 3. TARGATT™-HEK293T Master Cell Line transfected with donor plasmid containing GFP and attB. (a) Parental HEK293T cell line only (control); (b) Parental HEK293T cell line was transfected with donor plasmid containing GFP reporter by random insertion (+GFP); (c) TARGATT™-HEK293T Master Cell Line was transfected with GFP donor plasmid before ganciclovir (GCV) selection (GFP+); (d) TARGATT™-HEK293T Master Cell Line was transfected with GFP donor plasmid after GCV negative selection to eliminate clones without gene of interest (GFP+GCV). The data indicates that the TARGATT™-HEK293 Master Cell Line system provides a robust, fast and efficient integration platform for generating a uniform cell population with stable transgene expression in the hROSA26 locus. This platform paves the way for homogeneous expression of gene of interest and subsequent protein production. Figure 4. TARGATT™-CHO Master Cell Line with GFP transgene integration into the hH11 locus. 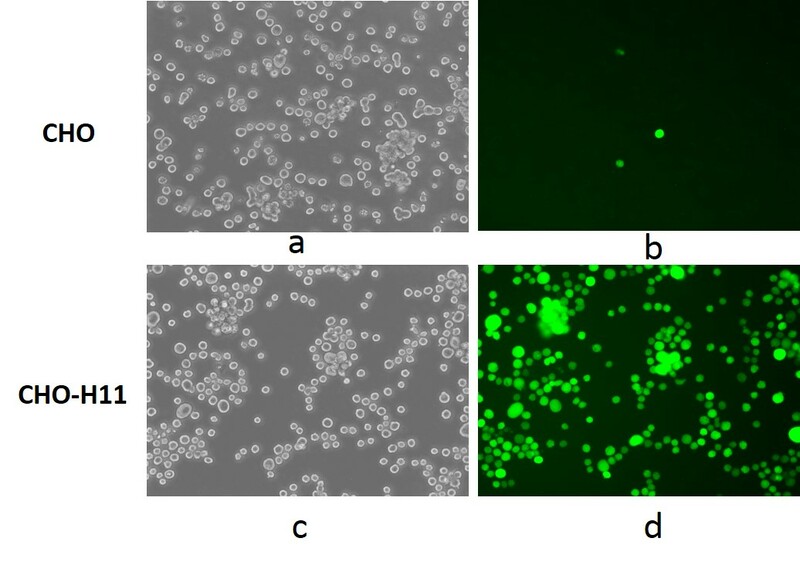 GFP signal was detected by fluorescence imaging after transfection with donor construct by random insertion in bright field (a) and GFP channel (b), and TARGATT™ integration plus GCV selection in bright field (c) and GFP channel (d). How does the TARGATT™ gene integration technology compare to the Flp-In™ System? Both TARGATT™ and Flp-In™ gene integration technologies involve site-specific, transcriptionally active locus, single copy knock-in, for stable cell line generation. However, in the Flp-In™ system elements of the bacterial (plasmid) backbone are co-integrated along with the gene of interest. The inclusion of the prokaryotic elements in the vicinity of the gene of interest could negatively affect the expression of the transgene. In the TARGATT™ technology the bacterial backbone will not integrate into genome, results in stable, uniform expression of the transgene. Unlike the Flp-In™ system, the TARGATT™ system is designed to select against random gene integration at sites other than the attP docking site (watch our Webinar for details). Can you generate a master cell line with the cell line I am interested? Yes, we can generate a TARGATT™ Master Cell Line in your cell line of interest. Can you generate a master cell line with docking site at a different locus? Yes, we can generate a TARGATT™ master cell line with a docking site at your locus of choice. We have already generated 2 master cell lines: HEK293T and CHO cell lines with docking site in hROSA26 and cH11 locus, respectively. Can we avoid ganciclovir selection? Yes. You can use the TARGATT™ system without ganciclovir selection. The TARGATT™ system has a >12% gene integration efficiency without ganciclovir selection and > 90% efficiency with ganciclovir selection, much higher than comparable technologies. Alternatively, if you require a higher efficiency but different selection criteria, we can replace the TK gene with other markers such as a fluorescent protein (GFP, YFP). After gene knock-in, you can select for “fluorescent protein-negative cells” using flow cytometry. What is the level of concordance between different TARGATT™ lines? The TARGATT™ system shows consistent integration at different docking sites and in different cell lines. We have tested two TARGATT™ Master Cell Lines: HEK293T and CHO with docking site in different safe harbor loci, hROSA26 and cH11 respectively. Both lines have similar integration efficiencies before (>12%) and after (>90%) ganciclovir selection. However, the integration efficiency might also be related to integration site you choose. Our preliminary data showed that the integration efficiency is much higher (>40%) efficiency before ganciclovir selection) at human H11 site in HEK293T cell. What is the size or diversity of the antibody library that can be made with the TARGATT™ HEK293T Line, and at what scale of transfection (number of cells used in transfection)? For 10 million cells at the rate of 12% stable knock-in before selection, you can get a 10^6 complexity in small scale. Although we have not tested in a large-scale population, it may be possible to get up to 10^8 complexity or more with the TARGATT™ system’s efficiency of gene integration. The TARGATT™ Knock-in Master Cell Line Kit uses PhiC31 integrase to insert any gene of interest into a preselected intergenic and transcriptionally active genomic locus (hROSA26, hH11, or other pre-defined safe harbor loci). The TARGATT™ technology can be utilized for generating knock-in cell lines and libraries for a variety of applications including reporter gene expression, gene knockdown, conditional/ inducible gene expression, gene overexpression, expression libraries for antibody discovery/ screening, bioproduction of recombinant protein, and disease modeling. Figure 1. Schematic representation of a lentiviral method of generating a mammalian cell library. Figure 2. Schematic representation of the TARGATT™ method of generating a mammalian cell library. The process is very similar to lentiviral library but more efficient. Venken, K. J. T., Sarrion-Perdigones, A., Vandeventer, P. J., Abel, N. S., Christiansen, A. E., & Hoffman, K. L. (2016). Genome Engineering: Drosophila melanogaster and beyond. Wiley Interdisciplinary Reviews. Developmental Biology, 5(2), 233–267. We will respond to you in 24 hours. An Applied StemCell technical expert is happy to help, contact us today!